One of the services that can be offered from a virtual assistant is the editing service. Many people have the gift of writing, but lack the skills to fine tune their work. This is the job done by people who make the professional copywriting, proofreading and editing . The editing business process involves the review of written material for grammar and mechanical errors created by other writers . Most editing companies receive their work in printed or electronic format and they will deliver the finished product in the same way. Of course, nowadays with the word processing tools, for istance, the editing work is much simpler than several years ago, however editing services are still much requested. Making money online selling editing services allow you to choose from work from home or from an office. You can edit short articles, technical manuals, e-books, web content or traditional books. If you want offer only electronic formats editing, you will need just a computer, a word processing software and a grammar manual. In other words, create your own editing company has extremely low start-up cost and it can be done easily from home. Find works will be easier if you have enough credentials, as for example a degree in the language with which you have to work offering your editing service. Also a portfolio and references that can demostrate your excellent work, will help you a lot to find customers. You can also think to join professional international organization, to be updated with the latest industry trends. One of the most popular place where to find work that can be done from home and online is Freelance.com . Here you have the option to look for the work that you want to do, including the editing service, and you may find it between the list of ones available. When you see the one you are interested about, you bid on it for the amount of cash you are satisfied to do the work if you win the job. To operate a successful editing service, you should strive to produce error-free material and finish your projects on-time or ahead of schedule. When possible, provide constructive criticism in a non-offensive way to your clients. Consider that you will have a lot of competition in the editing services world, so you should create a well designed website, with your credentials and if you already have, with your customer testimonials. You can offer editing services choosen from book or copy editing, business or dissertation editing, thesis or paper editing, essay or technical editing, fiction or novel editing, manuscript or proofreading. You may also think in specialize in some of them, in order to be more competitive. Remember also that athe beginning you have to enter the market by offering low prices, but with high quality service, of course. Make sure to be listed in sites that offer editing services or you can also think in purchase advertising space, for example in periodicals that target writers. Do not forget to be persistent, and consider that it will take sometime before you get your first job. 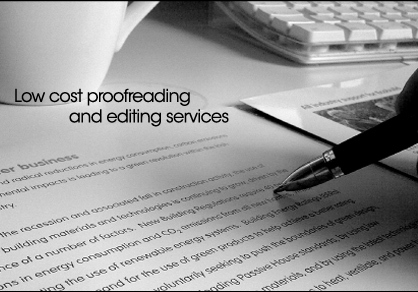 Once your editing service company is successful, you may begin to think about expanding and hire more editors. Another expansion opportunity could include starting a publishing house or creating an online magazine for example. You can make more money writing your own book that explains how to start an editing service company or you can offer courses to people that want to start this business. There are a lot of ways to make money online and above all get paid to write ! Good luck making money online with editing service !